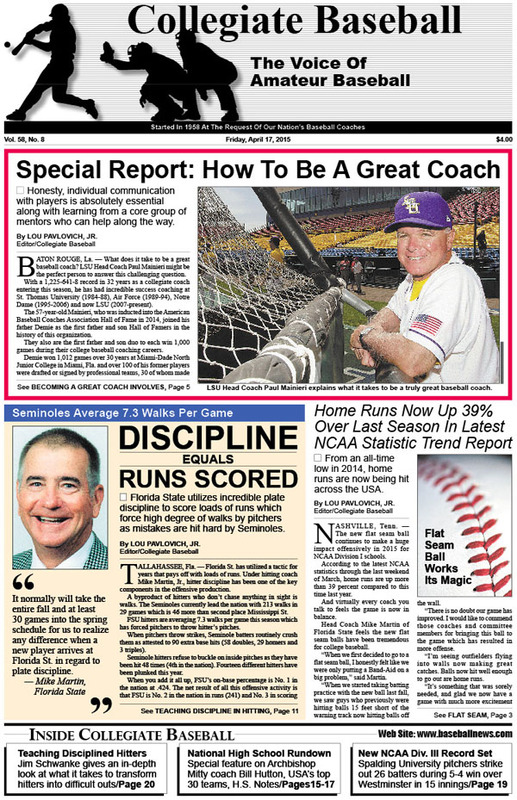 • Special Report: How To Be A Great Coach: LSU Head Coach Paul Mainieri gives an in-depth rundown on what it takes to be an elite skipper and what he has learned in 33 years as a collegiate head coach. • Hitting Discipline: Florida State utilizes incredible plate discipline to score loads of runs which forces high degree of walks by pitchers as mistakes are hit hard by Seminoles. • More On Hitting Discipline: Well known instructor Jim Schwanke gives in-depth look at how it is accomplished. • Home Runs Are Up 39% from 2014: From an all-time low last season, home runs are now being hit with regularity across USA. • Hall Of Famer Dies: Washington State’s Bobo Brayton had a huge impact on game of college baseball. • Lou Pavlovich Column: Ball park food is becoming insane. What happened to eating a simple hot dog? • New Product Roundup: Several new items will be staples in game of baseball for years to come. • NCAA Division I Notes: Incredible 15-inning contest won by Nebraska, 1-0 in top pitching duel of year. • Collegiate Baseball’s NCAA Div. I Poll presented by Big League Chew: Texas A&M No. 1 with 30-2 record, superb 2.08 team ERA. • Louisville Slugger National Players Of Week: Seven players put up extraordinary numbers, including no-hitter fired by The Citadel LHP James Reeves. • Big Name High School Coach Retiring: Archbishop Mitty’s Bill Hutton winds up incredible career that spans 33 years. • High School Notes: St. Francis (Mountain View, Calif.) captures Boras Classic North Division title with 1-0, 10-inning win over Clovis West..
• NCAA Division 2 Notes: Mount Olive’s Carl Lancaster wins 1,000th career victory with win over Catawba. • NCAA Division 3 Notes: Spalding sets new NCAA record with 26 strikeouts during 5-4 win over Westminster in 15 innings. • Charlie Greene Column: Positioning of pivot foot crucial for safe throwing. • Brian Cain Column: Matt Carpenter explains how crucial mental game is. • NAIA Notes: Grand View sets school record with 126 total bases during 27-0 win. • Junior College Notes: North Iowa Area hits 18 home runs over 4 games. To purchase the April 17, 2015 edition of Collegiate Baseball, CLICK HERE.